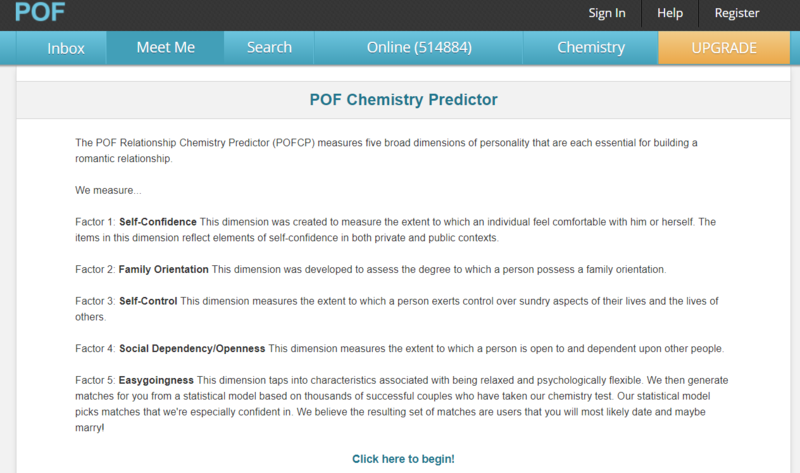 POF(Plenty Of Fish) dating app has an amazing feature named POF relationship chemistry predictor where you can test your personality and can get detailed report that talks about you. After completing the test you can get your most ideal match. It is based on thousands of people research. You can enjoy the test as well. We discuss about how to take POF relationship chemistry test. Open the URL and search for https://www.pof.com/. Enter your correct email and password so that you can login to your POF account. After you login to your account click on “chemistry” https://www.pof.com/poftest.aspx which is in second row of the page just below of “edit profile”. New page will appear where you can find 1 to more than 70 number of question which you have to read and click on any one of them among four which are Disagree, Somewhat Disagree, Somewhat Agree and Agree. If you totally agree then click on the circle below the agree, if you disagree then click on circle which is below of disagree and same method goes to somewhat disagree and somewhat agree. Then click on check my test. New page will appear where you will find your relationship chemistry test result in detail. On the button of the page you will find “continue to next test” which is in blue color box click on it. Another new page will appear of POF relationship needs assessment where numbers of questions are given where you have to select he option any one of them which you are agree with those options are : not at all like me, somewhat unlike me, somewhat like me and much like me. Then click on “done assessment” which in blue color box. This entry was posted in POF Features and tagged Features of Plenty of Fish, How accurate are the relationship, Personality Relationship Chemistry Test, PlentyofFish Updates Chemistry Test, POF Chemistry Predictor, POF chemistry test, Take POF personality relationship chemistry test on September 21, 2018 by wwe.